This week I had the pleasure of spending some time in Banff. Two youth leaders serving at the event where I was speaking surprised me with a day I’ll never forget. Thank you Jenn and Rebecca. I will make a playlist that describes how that day made me feel. You both are the best. I’ve never done any sort of drug that wasn’t prescribed to me by a doctor–but I imagine that breathing in crisp mountain air while hearing the sounds of glacial waters trickling around me is about as close to drug induced euphoria as it gets. Hello, my name is Brooklyn, and I am addicted to mountain air. My second favorite drug-like experience is reading really great books so I decided to try both at the same time. The good news is–you can’t overdose on mountain air or recycled paper, and mixing them has no adverse side-effects whatsoever. Since I knew I’d get to spend some time in the wild, I took a book with me that I have been wanting to read. It’s called “The Wild Robot” by Peter Brown. Peter usually writes and illustrates kids books, this is his first crack at a middle reader and I was excited to have it in my hands. How cool would it be to read about what happens when technology and wilderness meet? We all know what happens to an iPhone when it’s accidentally dropped into a river. But what would happen in a robot is accidentally dropped onto an uninhabited (except for animals) island and accidentally activated? How would she survive? What would she learn when everyone else around her was so different. Let me tell you, it was so cool to read this in the woods. But also on the plane on the way home. It was a page turning wonder of a book that made me smile and think and wonder and laugh and worry a little. 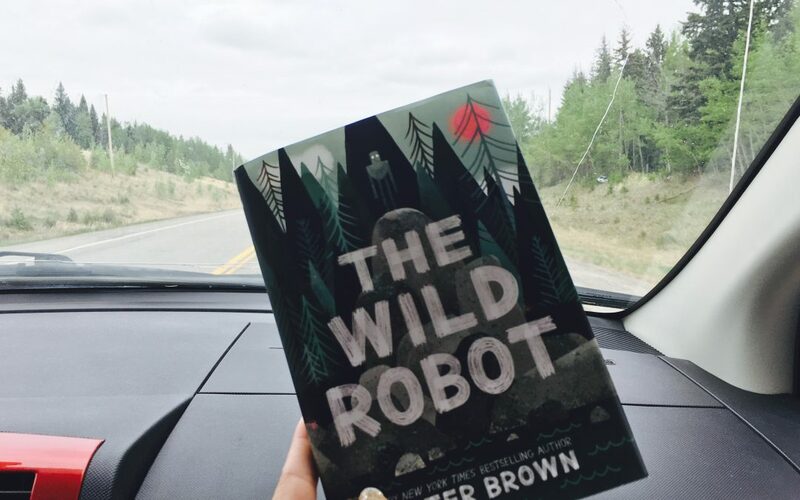 I cannot tell a lie–I cried once and also cheered for a robot that I could not see in the middle of Banff National Park. Hello, my name is Brooklyn, and I have an imagination that it’s becoming more and more visible in public. You need this book. Your kids need this book. For the love, buy it already. I don’t work for Little Brown books, in fact, I don’t even know who Little Brown is, just buy the book and thank me later. This is a great book to help you grow more in your love for middle aged kids. Ha! Middle aged kids. That’s funny to me. I like how it sounds. Seriously though, it’s tough to learn to love new ten, eleven, twelve year olds coming into your group, especially when you know how long it took for you to be able to connect with the outgoing tribe. So, you might need a little help, a little nudge, a little inspiration. I feel like this book can help youth leaders, parents, teachers remember what it feels like to be in a new world trying to adapt and survive. What if you woke up living in a wild and remote world? What if that’s what our 6th graders face every day of their middle school existence? What if we could understand and empathize more? Because it’s good for your soul to see how helping others ultimately helps you–love is like a boomerang, it tends to angle back and hit the sender. I imagine it could be a lot like how the robot was helped by those who caused her so much grief at first, the grief became her family and helped her home. So do you feel like you’re ready for them? When the new 6th graders “land on your island”, will you be able to speak their language and give them space to make mistakes? Are you willing to adapt and also be influenced by this creature coming to your territory. I think you’ll be ready because you will have imagined them already, and have loved them already in your heart.